Cheese Chipotle Or Chicken Burrito? This Cafe Serves Over 20 Types Of Fries! 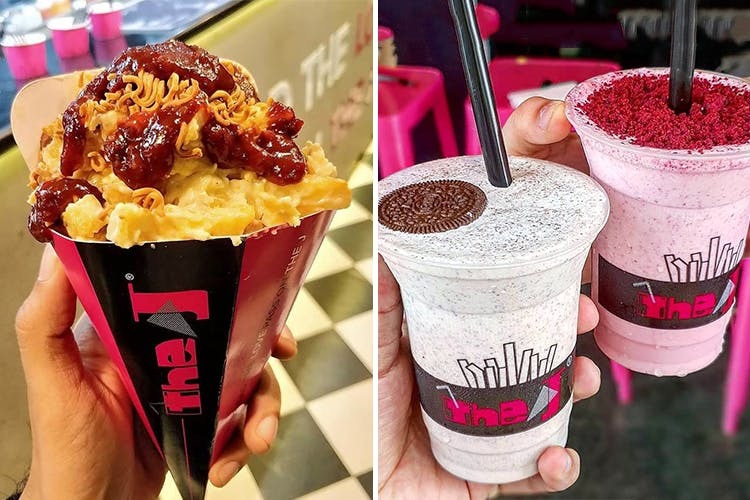 The famous Mumbai cafe, The J, is a cafe purely dedicated to fries and shakes. They've got 3 outlets in Delhi. From Jalapeño Cheese + Chipotle to Pizza Fries, they’ve truly mastered the mighty potato. Fries isn’t just finger food, a companion to your burgers, or just another part of your happy meal. Fries are a meal on their own, a saviour when you’re hungover, the highest honour a potato can achieve in its lifetime. The J knows how much the world loves fries—so much so that their whole menu is just fries (and shakes). They’ve got a load of veg and non-veg variants for you to choose from, and we’re telling you, you will be spoilt for choice. You’ll find options like nacho fries, cheese mayo fries, magic fries (fried Maggi, mozzarella, mayo, chilli garlic) and more in the veg section and tandoori chicken fries, sausage fries and their special, J In The Jungle fries (shredded chicken, jalapeño cheese, chilli garlic) on the non-veg side of the menu. The milkshake section has Belgian chocolate, caramel Parle-G, Nutella Monaco, and the whole shebang of shakes to give you a sugar rush. The outlets don't have ample seating, but then again, they're serving fries in a cone–as on-the-go as it gets. They also have a ‘make your own damn fries’ section where you pick your base fries, add-ons, and two sauces of your choice to stir up your own fries concoction.